Portsmouth coach Ben Dudley is hoping for a first London Two south-west win as the Rugby Camp side travel to London Exiles. Dudley, who took over at Rugby Camp during the summer, remains upbeat despite starting with three successive league defeats. ‘We will keep working hard towards a first win,’ said Dudley. ‘There are a number of areas we have identified where we need to improve. Portsmouth are boosted by the return of Darren Leggot from army duties and Kieran Heffernan is promoted to replace Darren Crabbe. In the three-quarters, Sam Ellis regains his scrum-half place after injury and Simon Morgan comes in at outside-half. Dudley moves to centre, where he partners Tom Chance back from injury. United Services Portsmouth have switched their London Three south-west game against Farnham to their 3G pitch at Burnaby Road (2pm). Their main pitch is being used as part of the Rugby World Cup festivities. Services are aiming to build on their excellent start to life at the higher level following promotion. They have won two of their three opening games and are fourth in the league – one place above the visitors. ‘We have found our feet at this level and everything has been positive so far,’ said director of rugby Matt Davis. The home side are strengthened by the return of Jordan Cracknell and Mayo Owinlua in the forwards and Luke Peters on the wing. 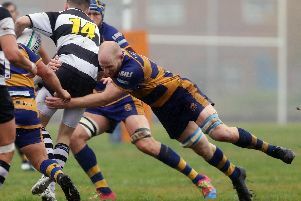 Fareham Heathens know they will face a tough examination up front at Farnborough in Hampshire One. Coach Bernie Rhodes is predicting a tight affair. ‘We did the double over them last season but games between the two teams are always close,’ said Rhodes. Locks Heath Pumas will expect to get back to winning ways when they entertain Ellingham & Ringwood. Petersfield entertain lowly Chineham at Penns Place. Southsea Nomads host Alton in Hampshire Two action at Furze Lane.